Firefly begonias are one of the few plants still blooming in my badly tended garden. The temperatures have tipped over 100 degrees almost every day this past month. I have had to do my walk at a local mall, and there is little chance that I will convince myself to pull the weeds or grasses that are strangling the roses and knocking out the delicate, whimsical stems of white gaura. This is my favorite plant, but you have to pull the weeds to avoid choking it. You have to tend to friendships, too. Today I am packing again for a class reunion in Indianapolis. At the last reunion, we did the twist. We even tried to do the chicken, but I just jerked my limbs around and imitated my friend who was a master yoga instructor. After a few decades, we knew how to laugh at ourselves and celebrate our silliness. The best part of that time together was being able to legally sip wine while sharing our stories. Forty years of them! I left Indy after college and the move to California was intentional. I wanted new experiences, a new way of life. I found it. Still, every time I return to Indy, I am grateful I grew up with these salt-of-the-earth people. They are kind. They listen. Rudeness has not wrapped its roots into the soil here. I feel grounded when I come here and visit with them. At this last gathering, we celebrated our lives. Freddi had a photo exhibit at a gallery downtown. Penny and Gus flashed photos of charming grandkids. Ellen talked of her work helping refugees settle in her community, and Larry, who had moved to Washington, D.C., shared his experiences in working with homeless shelters. But there was sadness, too. I learned I had lost my best friend from high school to suicide, and this hit hard. She was the first friend who was careful to tell me the truth: “If you wear your hair that way, you look like a cat.” I changed it. “If you date Paul, you will have fun. If you date Bob, you will die early on a motorcycle.” I had fun dating Paul, and Bob was in a terrible wreck our senior year. We called her Star. She did shine but more than the aura of her light, she had a gift for seeing the world as it was. I loved this about her. After high school, she moved first to California and then up north and landed in Idaho. I called but after a few years the phone numbers were wrong. Since we had lost touch years earlier, I was surprised that I struggled painfully with her death. I still do. 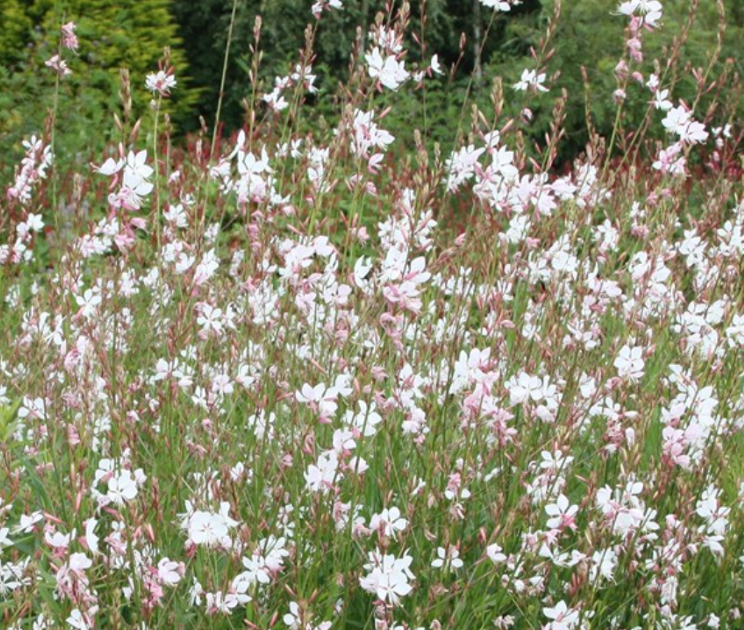 Tonight, I will pull the weeds that are wrapping their way around the white blooms of gaura. I will tend my garden in Star’s honor. Each day I realize more fully that you have to tend each friendship carefully. I will work on that, too. ©2017-2019 Copyright The Story You Need To Tell, Sandra Marinella.